We had a great time down in Edinburgh on Saturday the 27th of October at the North-west Highlands (NWH) Geopark Workshop, hosted by the Edinburgh Geological Society. 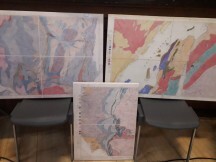 The main event began with Professor Rob Butler, from Aberdeen University, explaining the current understanding of the Moine Thrust Belt which lies in NWH Geopark. This formed 430 million years ago when the Moine schists and slices of the Lewisian basement were pushed over the younger, un-metamorphosed Cambro-Ordovician sediments to the west, on the famous Moine Thrust. He later recounted the historical ideas of thrust faulting and mountain building which stemmed from mapping in the NW Highlands. Lochaber Geopark had a stall at the event. 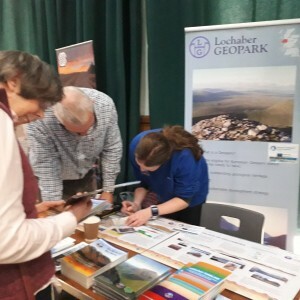 We were able to promote the geology of Lochaber, inform people of the Geopark’s recent and upcoming work, obtained new Friends of Lochaber Geopark and showed off and sold our publications and merchandise. 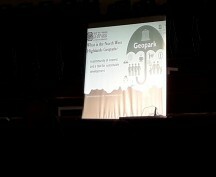 Dr Laura Hamlet, of NW Highlands Geopark, provided a talk on NWH Geopark. She covered what a Geopark is, what it does and how to support it. NWH inherited the status of UNESCO Global Geopark when the European Geoparks Network (EGN) became part of UNESCO in 2016. Lochaber were obliged to leave the network in 2011 as they did not have the source of funds to continue being a member and are currently being considered for UNESCO status. 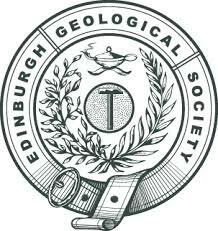 The value of our geology is not in doubt but we must obtain secure funding. It was interesting to hear Laura’s impression of the impact of being part of the UNESCO label. 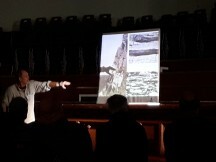 The number of people that attended the event showcased how important and interesting Scotland’s geology and Geoparks are to an array of people. Thank you to Edinburgh Geological Society for putting on a great event and to North West Highlands Geopark for an insightful workshop.